As per ASTM D 1238 & ISO 1133 - (Test Method A) to check the melt flow rate (MFR) of thermoplastics and compounds with auto cutting of flowing extrudate and prelogic facility. Microcontroller : • Highly efficient microcontroller with alpha numeric key pad. • Temperature range : Up to 400 degree C, resolution of 0.1 degree C & accuracy of ±/-0.1 deg C.
• Timer range : Digital timer with range up to 999.9 seconds with preset facility and buzzer output. 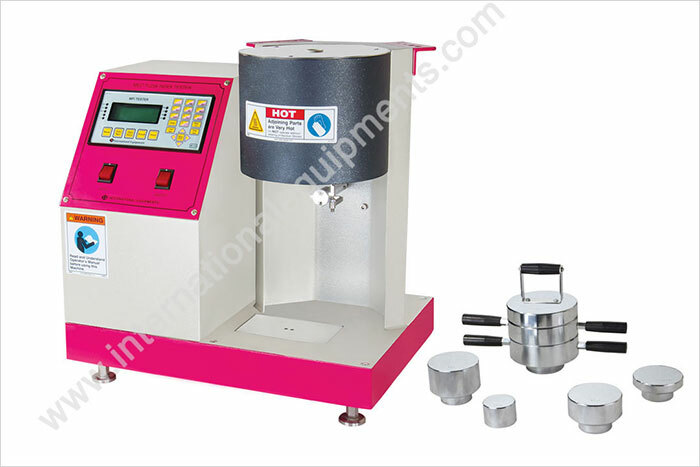 • Specimen Weighing : Automatic up to 60 gm and resolution of 1 mg.
• Weight : 1.2 kg, 2.16 kg, 3.8 kg, 5 kg & 21.6 kg hard chrome plated weights. • Digital Display : Individual MFI result with average results facility. • Accessories : T.C Orifice, Piston, Spoon, Spanner, Plumb line, Material charger,Barrel cleaner, Funnel, Tweezer, Orifice cleaner, & Accessory stand. • Power Supply : 230 Volts, Single Phase. This is an automatic operational model having features like Auto program, Auto Cutting of flow extrudate & Auto Weighing of extrudate, result calculation and storage via PC interfacing software. Equipment has a built-in weighing scale for weight measurement. The model is used to determine melt flow index(grams /10 minutes) as per ASTM D 1238 & ISO 1133 standards. Test Method A is a very simple and is focused on cutting the flowing extrudate with respect to time and recording the mass in order to derive final result. User just need to feed the material in barrel and press start. complete logic functions automatically. All what user requires is to load weight on top of Piston once hears an alarm. Further results are directly obtained.